The battlefield gameboard (hereafter referred to as the battlefield) is a hex grid, 13 hexes wide by 9 hexes deep. The battlefield is divided into three sections by two dotted lines, giving each player a left flank section, a center section and a right flank section. Where the dotted line cuts through a hex, the hex is considered to be part of both the flank section and the center section. These represent a wide range of terrain features and are placed on the battlefield to recreate the historical battlefield for each scenario. They are explained in detail later in the rules. Units may only move or battle when given an order. Command cards are used to order your troops to move, battle or do something special. There is one set of spare dice stickers. All light, light bow, light slinger, auxilia, warrior, medium and heavy infantry units are composed of four small size blocks. Heavy war machine units are composed of two small size blocks. 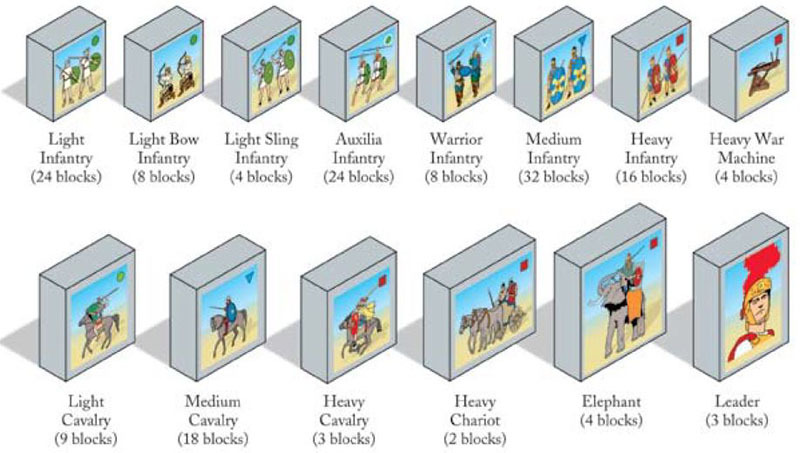 All light cavalry, light bow cavalry, medium cavalry, heavy cavalry, heavy cataphracted cavalry, camel and cataphracted camel units are composed of three medium size blocks. All elephant units are composed of two large size blocks. All heavy chariot units are composed of two rectangular blocks. Barbarian chariot units are composed of three rectangular blocks. A Leader is not a unit. A Leader is represented by one rectangular block. 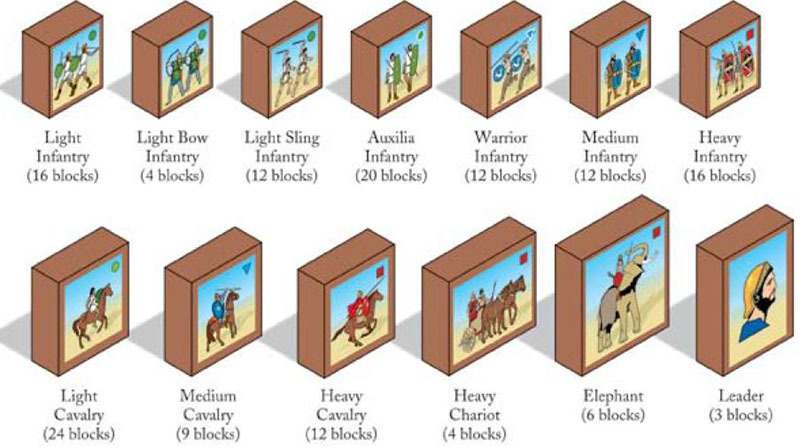 Example of a foot unit (4 blocks) and a cavalry unit (3 blocks). Apply appropriate unit stickers to the fronts and backs of the blocks for each unit. Place Roman unit labels on the gray blocks and the Carthaginian unit labels on the dark brown blocks. We suggest that you separate the blocks by color, gray for Romans, brown for Carthaginians, then sort blocks by size. Start with the Roman Units. Pull out 24 small gray blocks. Find the Roman Light Infantry stickers on sheet 1 of 3 (there are two of these sheets). Peel and place stickers front and back on the 24 small gray blocks. When you run out of the 24 blocks, move on to the Roman Light Bow Infantry. Pull out 8 small gray blocks. Find the Roman Light Bow Infantry stickers on Sheet 1 of 3. Peel and place stickers on the front and back on the 8 small gray blocks. When you run out of 8 blocks, move on to the Roman Light Sling Infantry 4 blocks... Keep going in this fashion until all the Roman units are completed and then move on to the Carthaginian units and dark brown blocks. It will be worth the effort! A few extra blocks and stickers are supplied as spares. Note: Some units included in these rules are not used in this game's scenarios, but will appear in future expansion modules. In describing the core of the system, these rules will make ref- erence to some units, such as light bow cavalry, which are not included in this box, but will appear in expansions. Apply the Victory Banner labels to only one side of the small black blocks. To help identify a unit's type, colored symbols have been placed on each label. Green circle: light infantry, light sling infantry, light bow infantry, light cavalry, light bow cavalry. Blue symbol: medium infantry, medium cavalry, camel. Red symbol: heavy infantry, heavy cavalry, heavy chariot, elephant, heavy war machine. Red symbol with white border: heavy cataphracted cavalry.